Potted shrimp are one of my favourite indulgences; sweet brown shrimp set in spicy mace infused butter…. delicious, if not really the best thing for your waist line. I guess you could make great big tureens of potted shrimp and dole it out to people but that just seems somehow uncivilised, half the fun is in having your own little individual pot to dip into as you wish. Shell and de-vein the shrimp, you might want to ask your fish monger to do this for you or buy them already prepared. Chop half of the shrimp quite finely, mix in the whole shrimp and add the mace. Melt 6 oz. of the butter in a pan, once all the butter has melted stir in the shrimp allowing it to absorb most of the butter. Add in the cayenne pepper, stir and pour into ramekins. Melt the remaining 2 oz of butter and pour over the top of the shrimp to seal. Allow to cool for at least 20 minutes before popping into the fridge for at least 3 hours, preferably 12. Love it or hate it the festive season is fast approaching. One of the biggest headaches in the run up to Christmas and New Year (I refuse to say “The Holidays”) is what foods to serve guests, particularly if you are hosting a party. Big heavy sit down dinners are all very well and good on Christmas day itself but for more laid back occasions it is often nicer to serve a selection of delicious finger foods – not to mention easier! As such over the coming days I am going to be publishing a selection of my favourite recipes for easy and delicious party food that everyone is going to love. First you need to hard boil your eggs, when boiling eggs make sure that you take the eggs out of the fridge in advance and let them reach room temperature before adding them to the water. Once the eggs are hard boiled and cool enough to handle you need to peel off the shell and cut the eggs in half lengthways. Using a teaspoon remove the egg yolks and place to one side in a bowl. 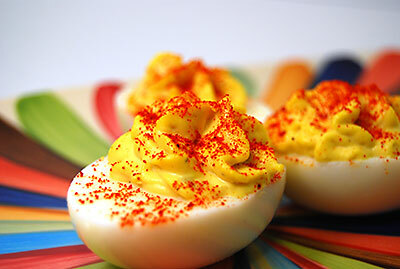 Add the mayonnaise and dijon mustard to the egg yolks and mix until you have reached a smooth creamy consistency. Very finely chop you spring onion and mix into your egg yolk mixture along with the cayenne pepper ensuring that it is well distributed throughout your mixture. Season your mixture with salt and pepper to taste. At this point you need to add your mixture to the egg whites; to do this you can either use a piping bag or you can fill them with a spoon. To stop your eggs from sliding around on the plate you can place them on some fresh crisp lettuce leaves.